Flood Bros Disposal present The Skinny & Houli Show as Houli continues at the helm while Skinny calls in from Florida with updates. 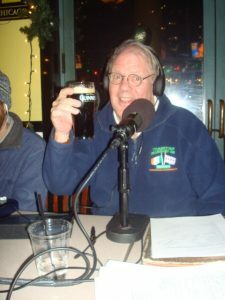 Our guests this week are legendary musician Jimmy Cloonan and his friends, Denny Keane, Mark Murphy, and Eileen Guest. This pick-up band from the south side brings the good time with them as they reel off handfuls of tunes like Fields of Athenry, Dirty Old Town, and Katy Daley with Jimmy on banjo, accordion, and mandolin, Denny on guitar and Mark and Eileen on vocals and guitar. Houli plows through the weekly “Who Died?” with gusto and throws in jokes, plugs, and community news as well while sailing the ship solo once again. Fun show! Just found your podcast,wll be listings in the future.Will try to hookup for a Sunday a.m run.How many marathons did you say you ran,over 40 wow.I got about half that plus 1 Ultra-50 miler,See you in the hood. Was wondering if you run into another runner from the old school,Tony Golden.